What's it about? A mismatched bunch of characters, including cavalier human Quill, genetically engineered raccoon Rocket, tough guy Drax the Destroyer, feisty green-skinned assassin Gamora and monosyllabic plant Groot (don't call him an Ent!!!) are thrown together to save....nay....guard the galaxy from some bad guys. Is it any good? In my review of Avengers Assemble, I likened that film to the video for Band Aid, in which several well-known characters got together for a laugh and, in the process, to save the world. 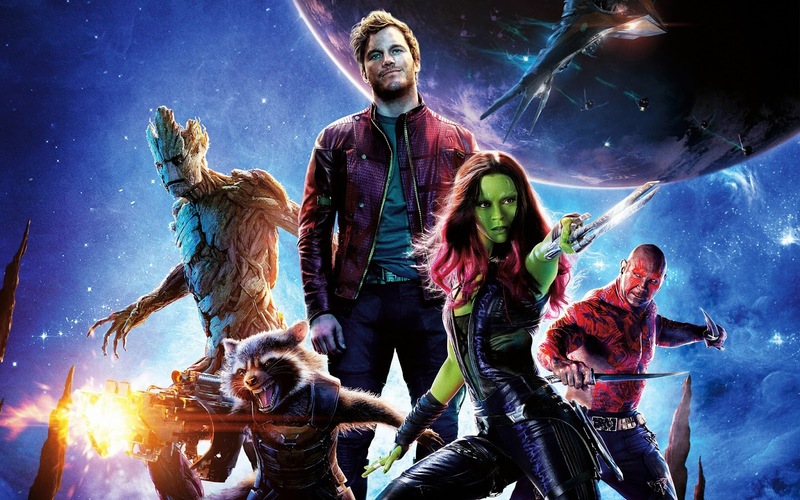 So the similar sounding Guardians of the Galaxy, which features no characters that normal people have heard of, must be like the recent Band Aid 30, right? Well, to be fair this is a lot more fun than singing about Ebola, and these guys are quite memorable, which is more than I can say the participants of Band Aid 30. Part of the appeal is that, unlike more recognisable Marvel characters, the Guardians are free from the baggage of other movies and incarnations, so there's a refreshing....er....freshness to proceedings, even as it follows a fairly formulaic save-the-universe plot. The characters spark off each other well as the plot barrels along, thanks to quick dialogue and easy-going performances from Chris Pratt, Zoe Saldana and professional wrestler Dave Batista, along with the voice-work of Bradley Cooper and Vin Diesel. It's also happy to poke fun at itself, there's a catchy pop soundtrack (if I were cynical, I might think this a blatant attempt to appeal to an older demographic than the teenage comic-book fan) and a generally light-hearted approach throughout. It does lack a memorable villain and despite a few efforts at touchy-feely moments, it never really stirs the emotions as the best comic-book/space adventure films do. It's just a good-natured, colourful space adventure, easy on the eye and the brain. Fair enough. I don't trust you. What do others think? I invited along my friend Hodor from Game of Thrones to watch this along with Groot, who had swung by the house for a groot beer. Here's what they thought. Thanks guys, that said it better than I ever could. What does the Fonz think? 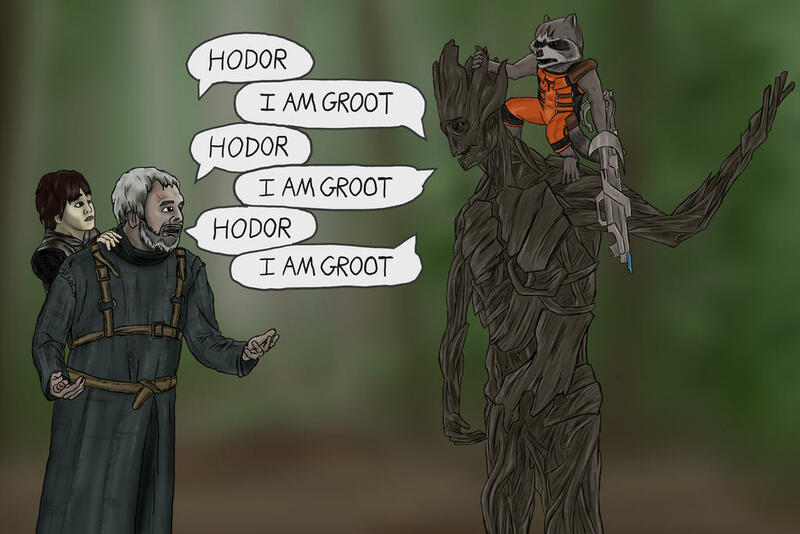 Groot fun.